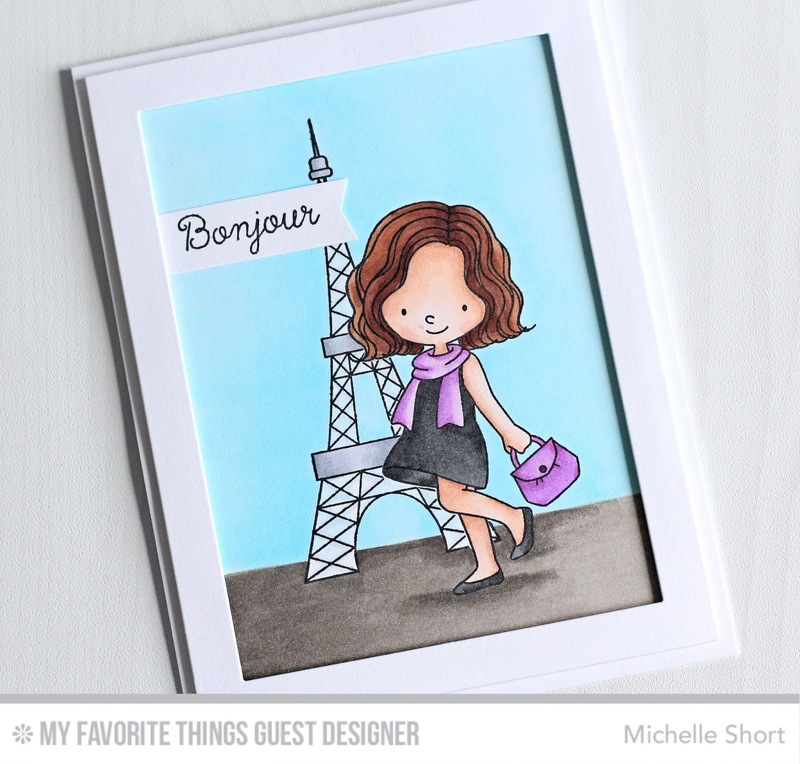 Hello there, I am so excited to be Guest Designing for My Favorite Things this month. If you have followed me for a while, you know how much I love this company, so I am very honoured to be asked to guest with them. My first card today uses the new Mon Cheri stamp set. I thought it would make a great, simple scene card. I started off by stamping the girl, masked her off and then stamped the Eiffel tower. The panel was then coloured using Copic Markers, adding a little Wink of Stella to the girl's bag and scarf. The image was added to a white A2 card base and then a frame cut using the largest of the Rectangle Frame Die-Namics was added on top with foam tape. To finish off, I added the sentiment on to flag and popped this under the frame on the left side. 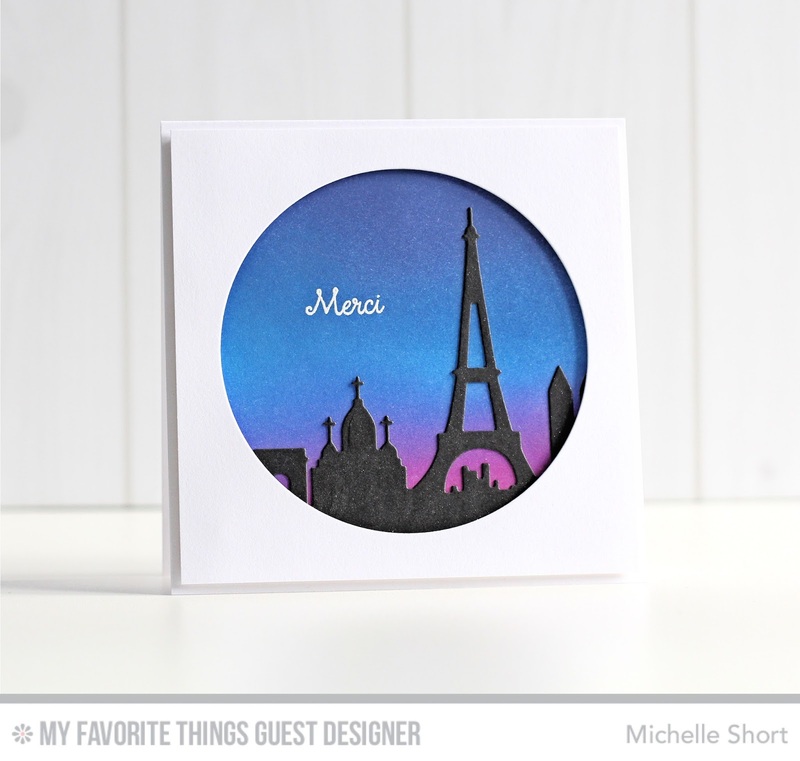 For my next card, I used the new Paris Skyline Die-Namic die. I started off by cutting this from black cardstock and then added a liberal amount of Wink of Stella on it for some added sparkle and shine. I took a white 5x5" card base and blended on some Distress Inks. I used Picked Raspberry, Salty Ocean and Chipped Sapphire. 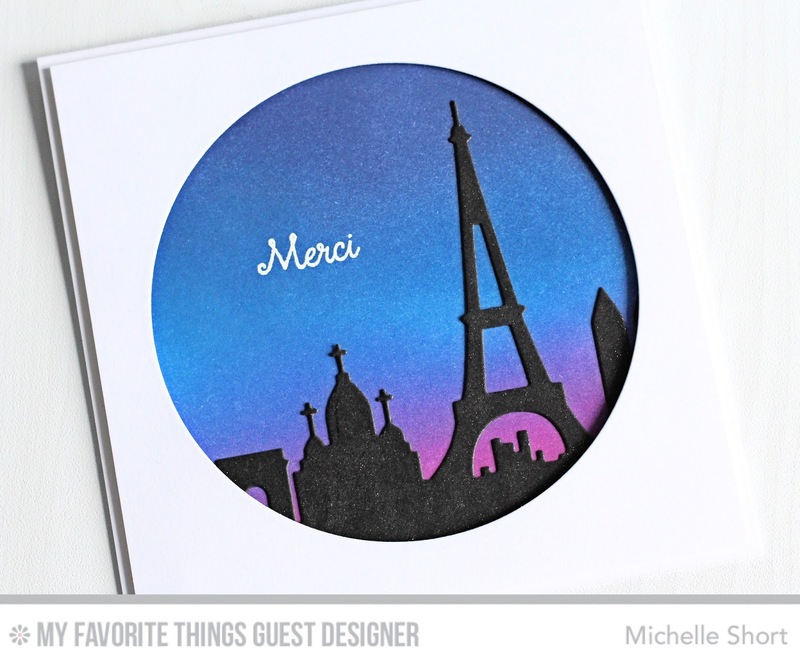 Once dried, I stamped the Merci sentiment from the Mon Cherie stamp set using Versamark Ink. I applied white embossing powder and then heat set. On a separate piece of white cardstock, I die cut a circle using the largest of the Circle Stax 2 Die-Namics. This panel was then popped on to the card with foam tape. Here are the links to what I have used on the card. Please click on the picture or wording to be taken to where I purchased it. No affiliate links are used in this product list. COPIC MARKERS: Skin: E13, E11, E00, E000, R20. Hair: E29, E27, E25, E23. Dress & Shoes: N8, N7, N6, N5. Scarf & Bag: V09, V04, V01. Eiffel Tower: C4, C3, C2, C1. Ground: W7, W6, W5, W3, W2. Sky: B00, B000, B0000. You can see more inspiration from MFT on their blog. I will have another post for MFT next week :) Thank you so much for visiting me today, I hope you have a great day! Congratulations! Both cards are lovely. Hello fellow GD! You've really done these sets justice - love the skyline (and I'm back to the drawing board for my next post, since one of mine is almost the same (although London, not Paris!) - I guess great minds really do think alike! Congrats on the guest DT spot. Your cards are fabulous. I love the scene on the first one. Lovely cards, Michelle! Congrats on GD at MFT! Beautiful cards Michelle. Love that gorgeous inked skyline. Love the colors of your sky ! Fabulous cards, I really enjoyed watching the video but I must say my favourite is the skyline card - simply stunning! I love this stamp set but I would like to see more ideas on how to use it. I love this card too!